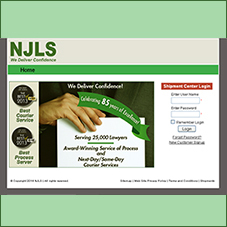 NJLS clients have secure, password protected access to the NJLS Client Login site. With the online tracking system, users can easily create online delivery slips and track packages. For online delivery slip creation, users can print multiple slips and labels to the same location or to many locations—all at one time. Finding the nearest NJLS Drop Box Locations also can be accessed from the Client Login. The Address Book feature includes a Search capability as well as the Delete ability for old addresses. There are several ways to track packages in the Shipment Center section, which includes calendar dates. Items are marked “In Transit” and “Delivered” depending on the delivery status. The Shipment Center also allows scheduled current shipments to be deleted. If you are an administrator of the Client Login, you can Manage users by adding new users and deleting them. Download the PDF on how to use the Web-based process service tracking system.